That Contemporary Art Space, was an artist-run space comprising exhibitions, residencies, lectures, newsletters, publications, events, galleries and artist studios and was organised by the many artists who formed the That Collective. That also opened a second and third artist-run space That Annexe at 210 Wickham Street in 1987 and exhibited Plateaux Plateaux by Diena Georgetti and in the That Annexe a.k.a “the garage” at rear 20 Charlotte Street in September 1987 for a series of collaborations, installations and “one nighters” before the space closed in feb March 1988 and was demolished for the development of a brutalist Telecom skyscraper. Artist-run. IMA Director Peter Cripps organised a meeting of artists at the IMA in Oct-Nov 1984 which was then formalised into a collective at John Waller’s residence in Moreton Street, New Farm in November 1984. The gallery and studios at the rear of 20 Charlotte Street opened to the public in May 1985. An artist-run collective comprising activists, designers, musicians, writers, creative and artists. 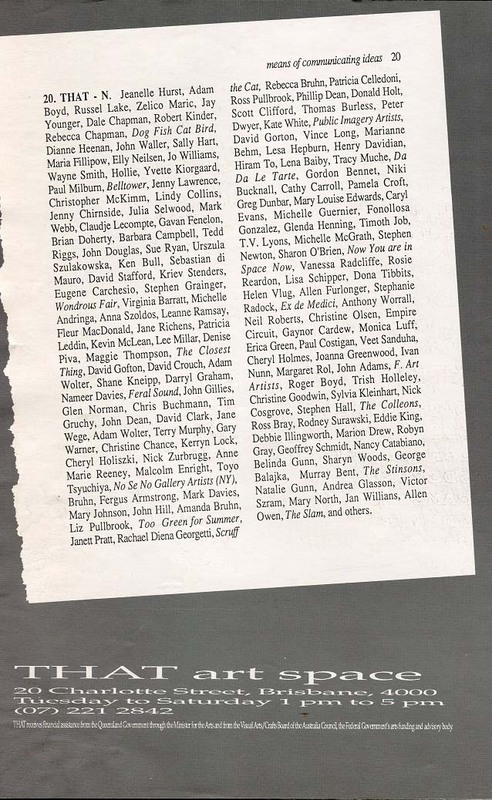 Key That Collective collaborators involved in the day to day work at the space during the 1984-1988 period included Jane Richens, Jay Younger, Sally Hart, Rebecca Chapman, Jenny Chirnside, John Waller, Angelina Martinez, Wayne Smith, Robert Kinder, Dale Chapman, Annette Coulter, Brian Doherty, Lindy Collins, Allen Owen, David Stafford, Sebastian Di Mauro, Paul Andrew. Oct-Nov 1984- January 1988 The galleries and studios were located down the laneway next to The Pancake Manor at rear of 20 Charlotte Street, Brisbane. Comprising galleries ( the large gallery was the main gallery until a second gallery known as “the garage” opened in August 1987 once used as a storage space by the warehouse owners), artist studios, artist publications, bands, dance parties, events and the Artworkers Union (1985)/ Queensland Artworker’s Alliance (1986). “THAT Space was established in June 1985 in a small two-storey warehouse at 20 Charlotte Street in the CBD, with access to the building via a laneway (the building was demolished in early 1988). The organisation operated as a collective that included artists such as Paul Andrew, Dale Chapman, Jane Richens, John Waller, and Jay Younger (and many others – up to 250 artists exhibited here). It included an exhibition space, a half-dozen studio spaces and, from about April 1986, the offices of Queensland Artworkers Alliance. While Paul Andrew occupied the unpaid position of ‘coordinator’, the decision-making processes within THAT Space were collaborative. Because it was a self-funded organisation, the viability of the space depended on the active support, and financial contributions, of a fairly large group that included studio artists, exhibiting artists and others. The underlying philosophy was inclusive, operating on the basis that the space ‘should be open to as many interested people as possible, simply because that invariably gives a place a more positive feel and tends to reach out and be more inviting’. As Michele Helmrich noted in her retrospective account of THAT Space published in Eyeline in mid-1988, such an open approach sometimes led to the criticism that the space exhibited too much ‘bad’ art. But in taking a risk with emerging artists, THAT Space’s ‘open space’ approach sought to build a context for emerging artists to present their work, where previously ‘there had been a lack of accessible infrastructures, little local art history, and, until Eyeline, no substantial venue for local art criticism’. The collective at THAT Space produced a monthly newsletter and was known for its social events, parties, performances, talks and other activities.